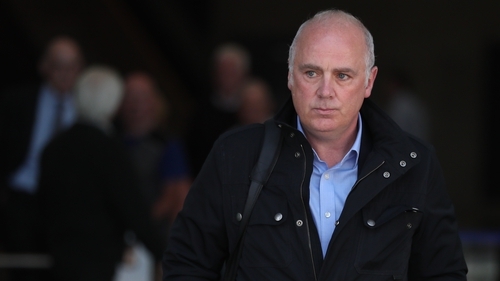 Former Chief Executive of Anglo Irish Bank David Drumm has been found guilty of a conspiracy to defraud and of false accounting at Dublin Circuit Criminal Court. The jury of nine men and three women spent just over ten-and-a-half hours deliberating before reaching unanimous guilty verdicts on day 87 of the trial. David Drumm conspired with Anglo's former finance director, Willie McAteer, John Bowe of the treasury department and former Irish Life and Permanent CEO, Denis Casey, to make Anglo's deposits look better than they were as the financial crisis hit in September 2008. A billion pounds sterling was sent from Anglo to IL&P and back to Anglo via Irish Life Assurance until the transactions totalled €7.2 billion. It was presented as a customer deposit in Anglo's preliminary end-of-year accounts. He did this dishonestly and deliberately, the jury found, to induce people to lodge money or leave money in Anglo, even when he and others knew the bank was going down the tubes. The jury took ten hours and 32 minutes to reach their unanimous verdicts. Drumm showed little reaction as the decisions were announced. Drumm had pleaded not guilty to conspiring with others, to dishonestly make Anglo's balance sheet look better by €7.2 billion between March and September 2008. He also denied knowingly presenting false figures to the market in December 2008. Garda Superintendent Gerard Walsh of the Garda National Economic Crime Bureau (GNECB) said the investigation was the most complex ever carried out by the bureau. Defence Counsel Brendan Grehan asked Judge O'Connor for "her indulgence" by allowing his client to be remanded on bail for two weeks "on humanitarian grounds". Mr Grehan said Drumm's wife and children had returned to the US for the graduation of one of his children. He also needed time to get documentation in order for his sentencing hearing. Detective Sergeant Michael McKenna of the GNECB said gardaí were objecting to bail. He said Drumm no longer had the presumption of innocence but had been found guilty of two very serious offences. He said Drumm would be acutely aware that the three others convicted of the same offence received substantial terms of imprisonment. He said Drumm had agreed to be extradited from the United States after spending five months in a maximum security prison and failing to get bail there. He said gardaí believed he was a flight risk. The court heard he had been back in Ireland for two years and had met all his very strict bail conditions during that time. Judge O'Connor agreed to release him on bail on condition that he sign on daily at Balbriggan Garda Station and agree not to apply for a new passport.